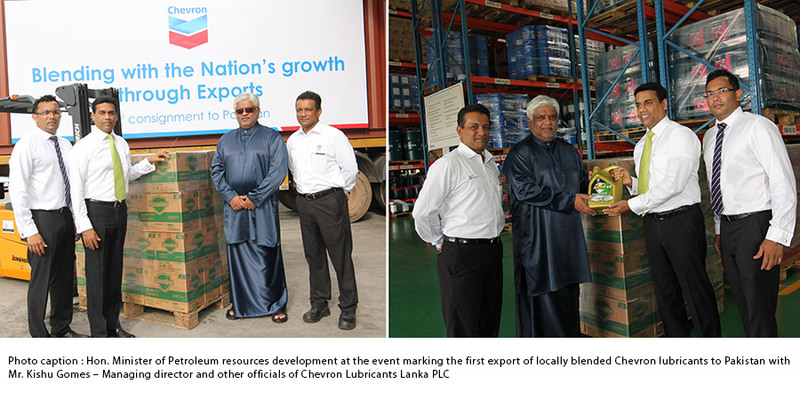 Chevron Sri Lanka props country’s economic growth through exports to Pakistan | Welcome to Chevron Lubricant Lanka PLC. Chevron Lubricants Lanka PLC celebrates another key achievement of exporting the first consignment of Havoline® PRO DS ECO 5 OW-20 Synthetic Dexos-1 licensed premium engine oil, designed especially for hybrid vehicles to Pakistan. This occasion was ceremonially initiated by Hon. Arjuna Ranatunga, Minister of Petroleum resources development. The first consignment was shipped on the 25th of August 2017, from Chevron’s state of the art lubricant blending facility in Sapugaskanda that was commissioned in December 2014. This good testimony to the technology capabilities of the High-Tec blending & modern warehouse facility to be able to generate foreign revenue through non-traditional exports. Chevron Lubricants manufacturing plant boasts of BS EN ISO 9001;2008 certification from the British Standard Institute with 45 million liter production capacity on a single shift with 1.4 million liter warehouse capacity. The laboratory is equipped with latest global technology to ensure quality production meeting global standards to offer in-house oil monitoring facilities to industrial customers such as Ceylon Electricity Board, SL Railway, SLTB and most private sector manufacturing entities. As the clear market leader in the local lubricant industry, Chevron Lubricants Lanka PLC, as a listed entity with 49% public shareholding delivers maximum shareholder value with an average payout ratio of 90% that is considered to be one of the best in terms of returns. As a socially responsible organization, Chevron focuses on road safety, vocational education, health and epidemic control to create a better future for all Sri-Lankans.